Porter-Cable 4212 vs 4216: Which One’s Best? 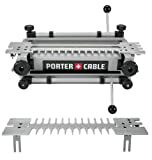 There are two primary differences between the Porter-Cable 4212 and the Porter-Cable 4216 dovetail jigs. The first is that the 4126 comes with the 4215 template for miniature box joints, half-blind dovetail joints, and miniature through joints. The second is that as a consequence of that, the Porter-Cable 4212 is less expensive. These are literally the only differences. Both come as complete sets in the box, and ready and easy to set up when it arrives. Both deliver great versatility in the kinds of angled joints you can cut for the amount of money you’ll spend. Both are covered by the same great warranty and customer service. It really just boils down to whether you need to spend the extra money on the one template right away. As mentioned in the review summary, one thing that separates what are otherwise identical tools is that the Porter-Cable 4216 comes with the 4215 template for cutting a few more miniature angled joints. More versatility means the edge in performance just simply goes with to the Porter-Cable 4216. There is just simply no way around that. Price is the other of the two things that separate these two dovetail jigs. The other is that by paying a little more for the Porter-Cable 4216, you get an additional template for cutting a few more kinds of angled joints. As a result, the Porter-Cable 4212 is a little less expensive. This is the kind of tool where it’s probably not a good idea to get cheaper if you want to spend less, but a matter of getting what you need for the best price in your budget. But, if you really want, you can get the template later as a standalone accessory. Just be advised that buying the Porter-Cable 4212 and the 4215 template separately will very probably cost more than just buying the Porter-Cable 4216. Both dovetail jigs are built on a sturdy stainless steel frame designed to support the router you use and to remain stable in operation. Both have the same flaw in that some of the exposed pieces of metal can if treated poorly bend or snap off. But, again, aside from one template allowing for a greater variety of angled joints and the resulting difference in price, there is absolutely no difference between these two. So, neither gets the edge here. Have we mentioned that there is no difference between these two dovetail jigs besides price and that one comes with an extra template? RIght. Both come with all the parts in one box, and both are pretty easy to assemble. If you get stuck, both have the same set of excellent, detailed instructions that should, if you follow them closely, deliver you to the promised land. Both, if used correctly, can deliver quality angled cuts at a great monetary value. The Porter-Cable 4216 gets a slight edge in design because it comes with that one extra template. It’s simply designed as a more complete part of your woodworking inventory. Porter-Cable’s line of dovetail jigs, starting with the 4210, definitely punches up to the competition. That is, it’s pretty affordable but delivers a lot more for what you pay that you’d get from the competition. They come, ready to set up, and are backed by Porter-Cable’s customer service and a three-year warranty. If you get stuck, there’s a great set of instructions that if you follow carefully will lead you — like a trail of breadcrumbs — out of the woods and right back to your workshop. The 4212 is the middle of the pack of this line, coming with one more template than what the 4210 does, but one less than the 4216. As a result, it’s a bit more affordable, even if it’s not quite as versatile. But before you decide that you don’t need a greater range of joints that the kind of joint you will need to cut is offered on the 4215 template. A full kit that arrives ready for a speedy set-up for use, the Porter-Cable 4216 offers the full versatility of Porter-Cable’s entire line of dovetail jigs. It comes with more templates than the other two, which makes it a more complete tool. It also comes at a slightly higher cost in dollars. If you are a serious hobbyist, it’s probably a better upfront investment, because while you can buy the 4212 and the 4215 template separately, you’ll wind up spending more than if you’d just bought the 4216. It’s not really a question of which is better, the Porter-Cable 4212 or the Porter-Cable 4216. They are both the exact same tool. The Porter-Cable 4216 is more expensive but comes with an additional template to allow you to make additional cuts. That’s really how you should break down whether to buy it. If you are new or never see yourself getting so into doing things like building cabinetry or drawers, you can skimp a little bit to see if investing the extra is worthwhile. If you’re a serious hobbyist or know that you’ve got all those extra little joints in your future, you’ll want to just go ahead and spend a little more to get a little more. Otherwise, there’s no difference and no way to tell the two apart.